Last week, Square Enix showed a teaser site dedicated to a new Final Fantasy title for smartphones. Today the countdown has come to an end and, as promised, the company announced at last The Final Fantasy Legends II, which will be available on both iOS and Android. As promised at the end of last week, Square Enix Japan announced a new game in the Final Fantasy series. 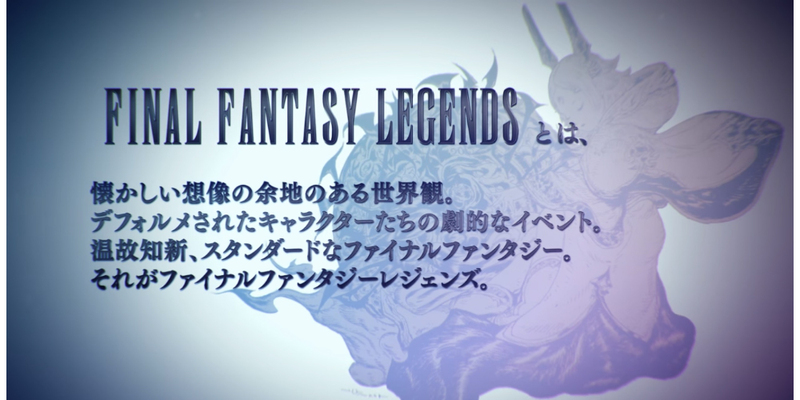 The news has been confirmed through a new video, and thanks to which we have discovered that the next game dedicated to the series is Final Fantasy Legends II. Directed by Takashi Tokita, already known by fans for his role in the production of other titles like Final Fantasy Dimensions, Final Fantasy IV, Chrono Trigger and Parasite Eve. This is a new RPG, but unfortunately, we have no news about it, but we are confident that Square Enix will not delay the launch and show considerably more details about the so far very interesting Final Fantasy Legends II, and would continue the success of the previous version designed for mobile devices. For now, all we have really, besides the confirmation of the launch, is that the publisher has posted a trailer on its YouTube account. In addition, the official website of Final Fantasy Legends II is also available to check that the game exists. We'll have to wait for the Japanese company to tell us more about the new game of the famous saga, generating a large following for years (when it series was launched for computers and game consoles).